And your point? If you don't allow objects from ssl-images-amazon.com, they will be blocked. Why are they pinned at the bottom like that? Because that's where Amazon placed these objects? Why won't NS hide the banners then? Because they are blocked objects! It offers you the possibility to see and eventually allow what is being blocked by NoScript. Do you realise how silly this sounds? NoScript has always shown placeholders for blocked objects. They provide finer-grained control and make it easier to see what's blocked. Clicking a blocked object placeholder lets you allow only the specific object, without automatically allowing other objects from the same site. Hiding the placeholder "because it's a blocked object" is nonsensical - it would completely defeat the purpose of having the placeholders. If you want help, you need to be detailed and specific about what the problem is and what you would like to achieve. Continuing with the detail-free one-sentence posts is likely to result in this thread being closed. And you answered a question with a question since your first response. Don't you see how that looks from your end? Maybe not since you do not want to help someone ignorant like me to understand. And thank you so much for telling me I am stupid for pointing out something with a screenshot as that looked to be explained the case in a detailed manner. No one would like to see them. It's that simple for anyone to understand. I don't know why you are so worked up about it. Keeping the blocked objects hidden or not should be left to choose for the users. Please ignore this stupid post if you find it below your expectations. But hey, I always try to learn and I would have rather helped someone with difficulties than acting like a bully. And thank you so much for telling me I am stupid for pointing out something with a screenshot as that looked to be explained the case in a detailed manner. However, this did not happen because there is an essential difference between the statement that a sentence sounds stupid and that the person writing that sentence is stupid. And even the comment you are likely to answer contains a detailed explanation which, like all previous explanations, you completely ignore without providing more than ambiguous one-liners to explain what you perceive to be a problem. Just take a look at how all this unnecessary clutter got accumulated. I posted a screenshot asking for help. Didn't have to write more than that. As the evidence was shown in its audacious form to understand. Pretty clear that the point was about the blocked objects grouped together. Simply put, if an ad blocker groups all blocked objects at the bottom, a user would find it unnecessary and would ask for it removal as they serve no real advantage. And the responses since the beginning I received are disrespectful and even then I tried to explain more. Why no one here pay attention on what's being asked rather than insulting someone who just tries to understand the strange behavior encountered? Rather I was being bullied. Just take a look at how I got responses. "And your point? If you don't allow objects from ssl-images-amazon.com, they will be blocked." "Because that's where Amazon placed these objects?" "Do you realise how silly this sounds?" "If you want help, you need to be detailed and specific about what the problem is and what you would like to achieve. Continuing with the detail-free one-sentence posts is likely to result in this thread being closed." Who would answer questions like that? Pretty clear that the point was about the blocked objects grouped together. Simply put, if an ad blocker groups all blocked objects at the bottom, a user would find it unnecessary and would ask for it removal as they serve no real advantage. Blocked items are not grouped together at the bottom by NoScript. Blocked objects are replaced by placeholders and therefore placed where the blocked objects are placed by the website. It would not make any sense to put the placeholders anywhere else (which would also be much more difficult than just exchanging the blocked content by placeholders). 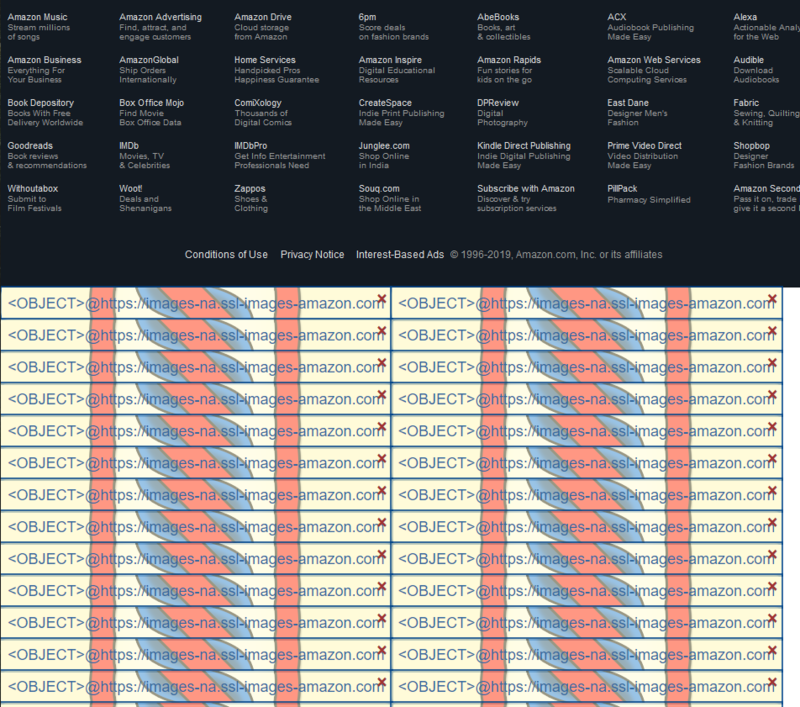 It is Amazon which puts all those objects at the bottom. Since you decided to block objects, there are placeholders. And NoScript is no ad blocker, by the way. thisthat wrote: Take a look. does not make it obvious at all that the problem is (or may be) that you apparently think it's NoScript which groups placeholders together instead of replacing blocked objects. Nowhere until the last comment gave any hint you would assume that. This is a very good example of how to not post support requests. Does not look obvious to you! You and the other fellow have long been on here and look more of a dev than a user. You have to look at the question from someone who does not know about all this. Rather both of you assumed the worst and considered this question inferior to your standard. I got cornered and bombarded with disrespectful responses. I know that NS is not an ad-block and that analogy was given to shade more light. I did think that NS grouped them. Why would you think I would question Amazon is beyond me! As I said before I am a novice to you all pros out there and the way this case was handled showed how poor support staff is here.